Flirting with the oldest temple in Tokyo (Sensoji) is Kappabashi-dori. The street crammed with specialty stores serves culinary professionals, home cooks and foodies from abroad. (No special invites needed.) Restaurants all over Japan rely on Kappabashi-dori vendors to provide them with plastic food. Yes. Plastic replicas of what a restaurant serves are often showcased. After getting my fill of gawking at the expensive fake soba and sushi (which look mouthwatering good), I did some serious shopping. Scores of stores cater to chefs who specialize in Japanese, Italian and French cooking. Beckoning to me were the shops for bakers. Bring cash. Many shops in Japan (including the stores on Kappabashi-dori) do not accept credit cards. My favorite buys from the baking shops include mini Madeline tins and chocolate cat molds. If you are a cat lover, Yanaka is a must. Yanaka is a hop, skip and jump from Kappabashi-dori. Stores sell cat pancakes and cat tchotchkes. You won’t miss them. Figurine cats adorn the shops. Besides being the town of ultimate cute catness, Yanaka miraculously survived the bombs of WWII. So Yanaka located in shitamachi (literally downtown in Japanese) is an opportunity to travel back in time to old Japan. Before you plunk down your precious yen at a cat café, remember that most places forbid you to pick the cats up. (This cat lover and owner would recommend spending your cash on a hedgehog or owl cafés. To celebrate awesome cats and colorful tools for culinary professionals in Tokyo, I baked Barefoot Contessa banana cupcakes. The recipe was refined to even greater deliciousness by my English friend, April J. Harris. Planning a trip to London? She has insider secrets…My secret to extra yumminess is chocolate! So, I swirled chocolate frosting atop the cakes. 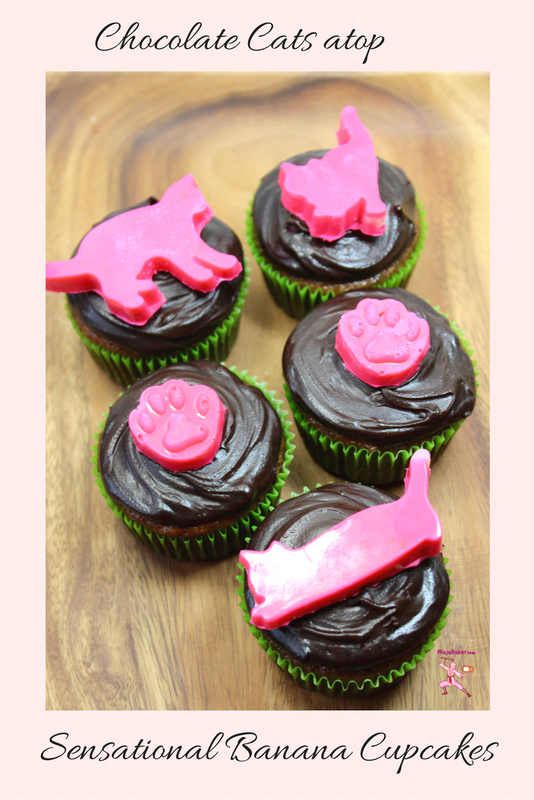 The lovely banana cupcakes, I garnished with pink chocolate cats popped out of Kappabashi-dori silicone forms. 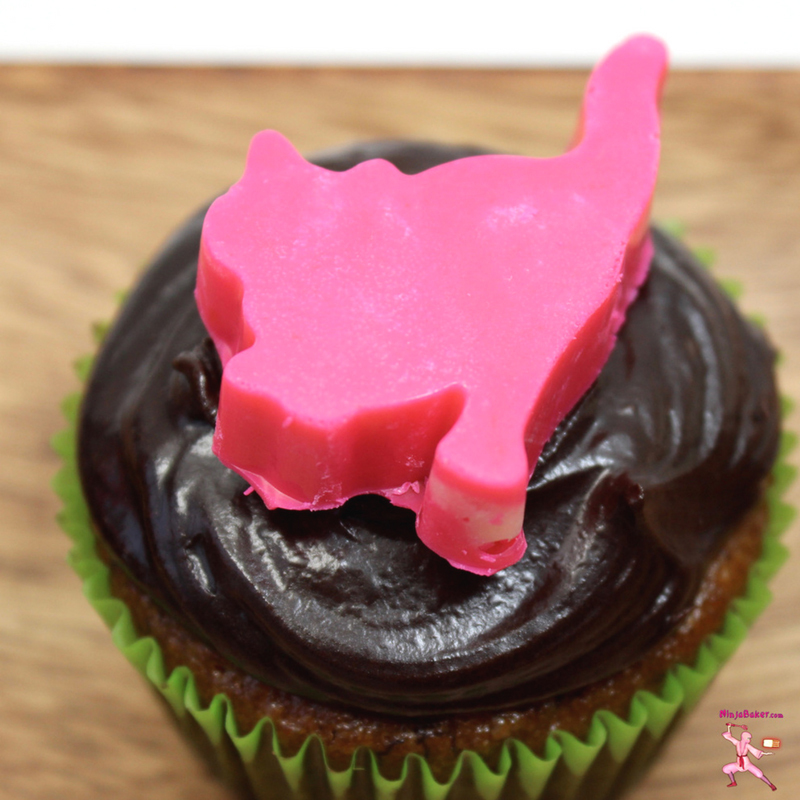 This banana cupcake frosted with chocolate frosting is the cat’s meow! My fellow foodie and travel friend in England, April J. Harris adapted Ina Garten’s (aka the Barefoot Contessa’s) banana cake recipe. Citrus peel tempers the sweet bananas in cake. The sour cream brings tenderness to the crumb. Frost according to taste. Or with chocolate. Garnish with a chocolate cat created from a silicone form purchased on Kappabashi-dori in Tokyo! Pop cupcake cases into 21 muffin tins. In a large bowl, sift together the flour, baking soda and salt. Set aside. On the low speed of a KitchenAid mixer, mash the bananas. Mix in the sugars and blend well. Pour in the oil, eggs, sour cream, vanilla and orange zest. Combine thoroughly. If using nuts, stir in the chopped walnuts or pecans. Divide the batter into the cupcake cases. Bake for 24 minutes or until a toothpick inserted in the center comes out clean. When cooled, frost with dark chocolate frosting. Or your favorite frosting. Garnish with a chocolate cat or your preferred topping. 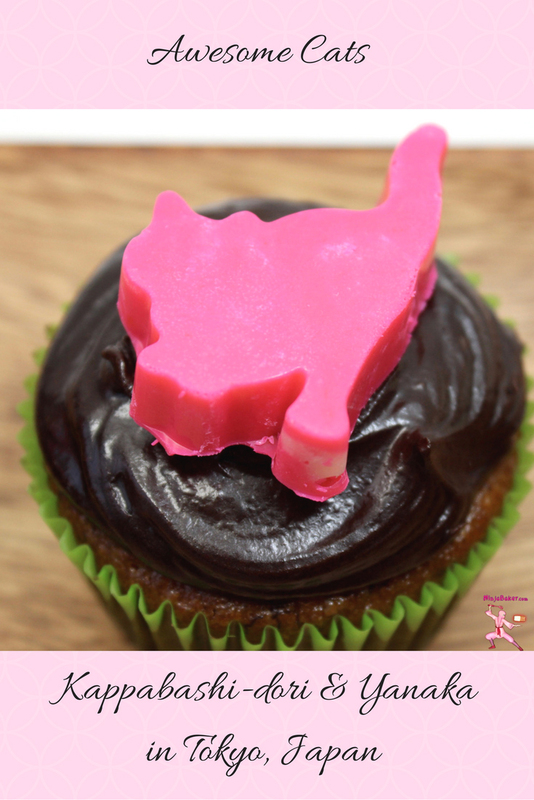 To make your version of the pink cat: Pour a package of white chocolate chips into a bowl. 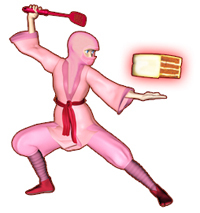 Sprinkle pink candy coloring oil over the white chocolate chips. Place over a pan of simmering water. Stir from time to time until melted. Pour into forms. Cool in the refrigerator for about 20 minutes. If the chocolate still looks shiny, give it another couple of minutes. 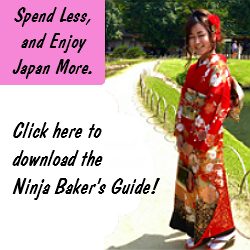 Wishing you awesome cats, the Barefoot Contessa's cupcakes and culinary trips to Tokyo!